Believe it or not, this is the first time I’ve ever made lasagna. I’ve always liked it, but it seemed like a lot of fuss for something that was made out of noodles and ground meat. Though out of sheer boredom from including penne, rigatoni or ziti in my weekly menus, I decided to give it a try. My husband and I agreed that it should be a healthier version, meaning substituting regular noodles for whole wheat noodles and ground beef for ground turkey. That being said, I used whole fat cheeses in order to keep most of the flavor and richness for which lasagna is known (and craved). In order to come up with this recipe, I stitched together a few different ones that I came across online, from my best friend and on the back of the lasagna noodle box. I think it works really well and my husband likes it so much that he eats the leftovers for lunch, a snack and dinner the next night! P.S. The garlic bread is the Texas toast from – Walmart! It’s pretty much the only thing I go to Walmart just to get. It’s in the specialty bread section and here in Phoenix it’s about $4 for a double loaf of it. In a large skillet brown ground turkey. Stir in 1 jar of pasta gravy, simmer 10 minutes, but don’t cook off too much of the sauce. In a large bowl, stir together ricotta cheese, 1 ½ cups mozzarella cheese, Parmesan cheese, eggs, oregano, basil, garlic, salt and pepper. Spread about 1/3″ of pasta gravy in the bottom of a 13×9 glass baking dish. Arrange 3 lasagna noodles vertically over sauce, overlapping edges. Spread 1/3 cheese mixture over noodles, then spread about ¾ cup of the meat/gravy mixture. Repeat layers, beginning and ending with pasta. Top with remaining meat/gravy mixture, sprinkle with remaining ½ cup mozzarella cheese and add additional Parmesan cheese is desired. Cover with foil. Bake 45 minutes or until hot and bubbly. Remove foil and bake for about 10 min. longer, or until lightly browned. Let stand 10 minutes before serving. Serve with a Caesar salad, Texas toast and a glass of wine! You also can bake in two separate loaf pans (just split the ingredients and do layers of two noodles lengthwise in each loaf pan) and freeze one for a future meal. This entry was posted in Uncategorized and tagged Dinner, Food, Pasta, Recipes. Bookmark the permalink. Looks delicious!! I have to try this one. 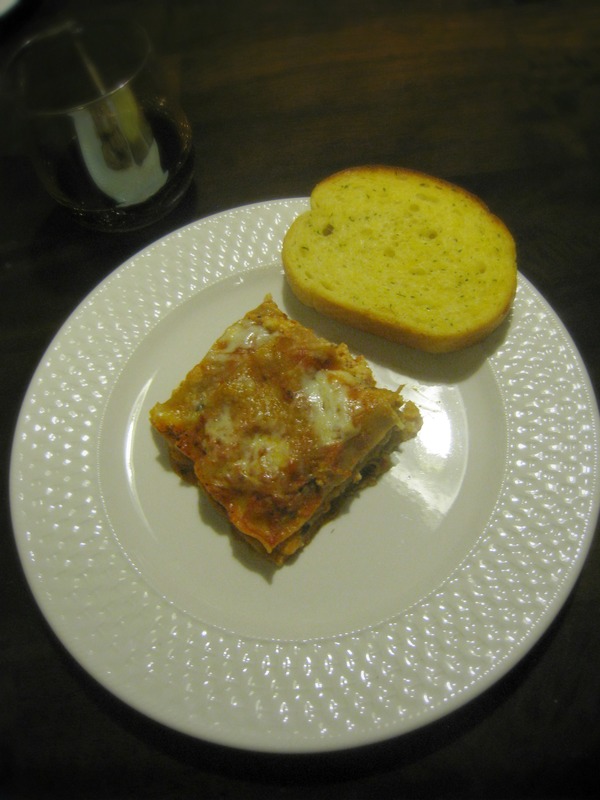 We always use ground turkey for speghetti and baked ziti so I know that this lasagna will be a hit! Thanks.